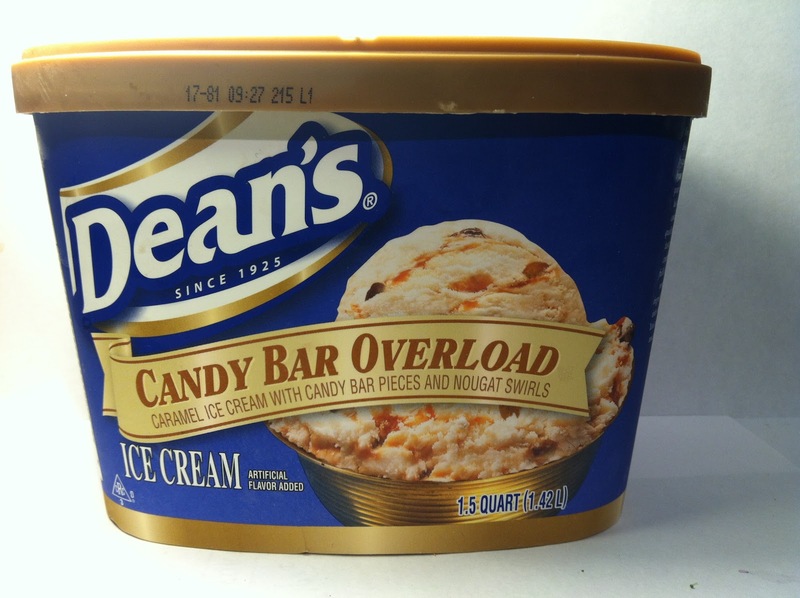 As I've said in previous Dean's reviews, I haven't had the best luck reviewing their ice cream products. Although, my last Dean's review of the Mackinac Island Fudge did turn out to be pretty solid, so I at least felt good heading into this review as this was a "full power" ice cream like the last one and not a low calorie/fat ice cream like the first couple. I picked this up at Meijer on sale for $3.00 for the 1.5 quart container. Each container contains about twelve servings of ice cream at about 160 calories per serving, so it's not a total guilt-trip/calorie bomb like Ben & Jerry's, so that is a nice feeling, I suppose. As you can see from the label on the pint, this is made up of caramel ice cream with a nougat swirl and candy bar pieces. If you can't tell in the picture, the caramel ice cream does have a sort of tan hue to it, so at least on a visual aspect, this one does look like caramel. 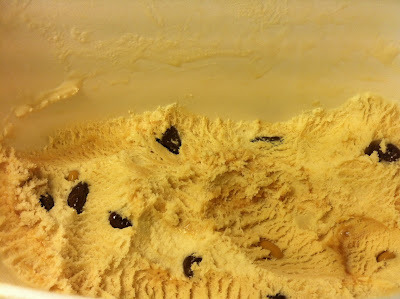 After checking that out, it took me quite a while to find the rest of the ingredients in this ice cream because it seemed like I had to go at least a fifth of the way into the container before I could find any candy bar pieces or the caramel nougat swirl. Outside of the Mackinac Island Fudge ice cream, this seems to be a common and exasperating problem for Dean's ice creams. Fortunately, I was able to find enough pieces to get a decent picture near the bottom of the container that included all of the ingredients. FYI, the candy bar pieces include normal peanuts and also chocolate covered peanuts. Frankly, it seems like this ice cream pint is a deconstructed Snickers bar. It tastes like a deconstructed Snickers bar as well too when you are able to get a spoonful that includes the necessary ingredients. If you can't get any of the add-ins, what you get is a serving of "caramel" ice cream whose flavor has a barely noticeable sweet caramel taste. It's stronger than vanilla, but it certainly doesn't taste of strong caramel. When you are able to get all the pieces and add-ins though, this is a pretty decent ice cream. The thin and hardly present caramel swirl is gooey and sweet. The peanut mix-ins add a great crunch (again, when you can get them) and the chocolate covered candy pieces are a nice, semi-sweet crunch as well. Too bad that you are unable to get that spoonful all that often though due to Dean's continued dispersion failures. Buy It or Fly By It? This one gets a FLY BY IT rating because Dean's can't seem to figure out how to spread mix-ins throughout a container of ice cream. If they could do that, this one might get a different rating because it is not really all that bad if you are able to get all the ingredients together. Unfortunately, that happens so infrequently that it makes this ice cream purchase basically worthless. Too bad. I hate it when mix ins aren't dispersed well, so you end up with just big spoonfuls of plain ice cream!